Are you interested in being trained as a ‘Parent Peer Support Volunteer’? 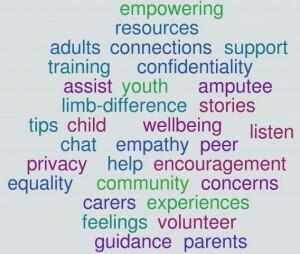 If you are the parent/carer of a child with limb difference or an adult who grew up with childhood limb difference this volunteer opportunity might be for you? A FREE webinar to train volunteers is being run by Limbs 4 Life on Thursday 26th November 2015, 8pm AEDT. Trained Volunteers can then be matched to other parents / carers seeking the support of another person who ‘has been through what they are going through’. Peer support may be provided over the phone, via an email or occasionally a face-to-face meeting. The FREE training will involve participants submitting an Application Form, being police checked, taking part in a one hour webinar training session (Thursday 26th November 2015, 8pm AEDT) and undertaking a short survey after the training. You will also receive a Program Manual, full support from Limbs 4 Life staff and be insured as a formal Limbs 4 Life volunteer. The Parent Peer Support Volunteer Program is being offered by Limbs 4 Life, through our Limbs 4 Kids program. If you would like to reserve a place in the training or want more information about the Parent Peer Support Volunteer Program contact Fiona at kids@limbs4life.org.au or call 1300 782 231. Alternatively, download and return the Application Form via email to reserve your place immediately. We hope you can join the training and become an important Limbs 4 Life volunteer.